Share this Property on any device. Your friends name * Enter one or more recipient friend's name separated by commas or spaces. Recipient Email(s) * Enter one or more recipient email addresses separated by commas or spaces. Message Enter your message or notes here to be included in the email. The nearby Ulua and Mokapu Beaches are a quick drive down the hill from the Grand Champions Villas in Wailea. The complex is surrounded by lovely tropical gardens. It is located in the exclusive Wailea Resort. The complex offers two swimming pools, sundecks, spa tubs, restrooms, showers and barbecue grills. In addition the championship golf courses of Wailea and Makena are minutes away as well as the famous Wailea Tennis Club. Wailea Grand Champions consists of 188 units in 20 two- and three-story buildings. Each unit offers a lanai with garden views. Same day bookings (meaning arrival is within 24 hours of making the reservation) requires a phone call to Rentals Maui for confirmation. Unit #51 is a two bedroom two bath garden view unit that can sleep 6. There is a king bed in the master bedroom, two twin beds in the guest room that can be made up as a king upon request and a sofa bed in the living room. There is Cable TV/DVD player and high speed internet service. It also features a fully equipped kitchen, washer and dryer, and AC in all rooms as well as ceiling fans for your comfort.In addition to the list of outdoor amenities, this unit also has an assortment of children's beach toys. It can sleep 6. We liked the location of this unit. We used the pool and bque often and it was very convenient. The condo was clean and well stocked. We would stay here again. Our overall stay was very good at the Grand Champions 51 unit. The onsite property management staff was very helpful during our stay and the unit's location to shopping and beaches was very convenient. It was fairly easy to check in. It was clean and tidy. The carpet and bedding were worn out. The pool area was quite nice. It was in a very convenient area. my stay in Maui was rather quiet. I took a fall rock climbing the week prior and thought that maybe I would be fine. i basically was in the condo all week. Was an overall good experience, the weather was not the greatest. Location was good, rental was adequate. Unit needs some updating, but good. The condo was great, the only negative thing may not concern others but the unit was at the very entrance to Grand Champions and we did hear a lot of cars going in and out. But the sound of chirping birds in the morning made up for it. Also the street lights kept the bedrooms with light at night. The kitchen had all the spices and cooking oils we needed for cooking our food. There was also all the laundry detergent and softener needed for washing, The trees have grown since the picture on the web was taken. 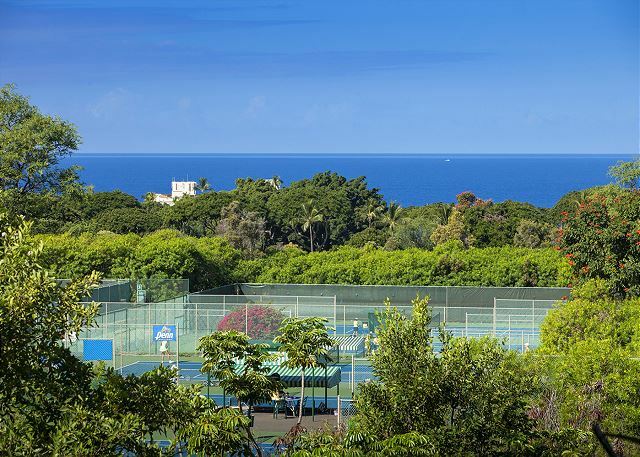 We still had a great view of the ocean, the tennis courts were a minimal view which was fine, the lush tropical view was better then viewing the courts. There was also boogie boards and beach chairs. Very nice experience at Grand Champion #51. The unit was a great fit for our family but could use a little updating. One of the shower heads was not working properly but this problem was taken care of by the rental Rentals Maui quickly. We would happily stay in this property again! I took my 94 years old mother to Maui for her granddaughter's wedding, renting this condo is the best thing we did for this trip. It's spacious and clean, the parking is right outside with a walkway to the front door, perfect for us to use the wheelchair for transferring my mother to the car. The balcony was perfect for breakfast in the morning, watching the ocean and listening to the birds! Love the place, will for sure try to get this unit again next time we come! This is our first stay at the Grand Champions #51. In the past we had always stayed in south Kihei. We loved the location of this condo as it allowed us to be closer to many of the shops and beaches that we enjoy. The condo can be a little noisy as it is located next to the road, but it is also in a wooded area and we enjoyed hearing the wild birds. While I thought some of the furnishings could use updating, the beds were comfortable and the condo was very clean. We would not hesitate to stay at #51 again. We traveled woth 6 people, 4 of which were children. This condo met our needs and was very comfortable. There was a/c which was a huge bonus! Came equipped with boogie boards and chairs for the beach, including a cooler. The pool is nice and BBQ on site. The property was located in a beautiful and safe part of the island. The groomed grounds, view from the condo, and kitchen/eating area added to our wonderful experience in Maui. The condo easily accommodated two couples and one child. We were also grateful to have boogie boards, beach chairs and sand toys for our activities. When returning to Maui, I will certainly consider staying at this property again. The place was totally outdated. Absolutely no towels and air conditioners are very loud and extremely old. The twin beds were extremely old and uncomfortable. The bedding was old, and the kitchen was outdated as well. For the price , we have rented many other untits in The Grand Champion complex that far out due this unit. Very spacious suite that suited us very well. Lots of attention to detail and a wonderful deck with a beautiful view. Our only complaint was that the beds in the smaller bedroom were not very comfortable, seemed smaller than twins, and could use nicer sheets and blankets. Other than that we would stay again. We stayed for 2 weeks at the end of March this year. It was a full house,but we didn't spend much time indoors. We found the condo nice and clean, checked mattresses for bed bugs, found none, so as we arrived late we all went to bed. Morning arrived with the wonderful songs of birds, that was super, we loved them. In the evening when the birds came home we told the kids it was bed time. The condo was close to almost everything, shopping, beaches. A short walk to the shops at wailea, my favorite place right after the beach! Pool was handy for later in the day when the kids, 10 and 2, needed to cool down in the evening. Would stay again, for sure! Management very accommodating and easy to work with. Only complaint was lack of sharp knives. Be back in 2016! Our condo where we stayed was a good place, it's a quiet place except in the morning around 4:30 the birds start making noise.The condo is cleaned, except there is no light in the dining room & also outside the front door.The large frying pan is no good, it's peeling off the teflon coating that's why we didn't able to use it & the knives are all dull.We went to your office in Kihei on Oct.8,and told the receptionist about our problem, but nothing happen,we didn't get a replacement for kitchen utensils. I still recommend this place to a friend. The activities we attended were Luau night in Marriott & we had dinner cruise also.We went to Maui acquarium, lots of places to explore. We ate in one of nice restaurant in Lahaina by the beach. Lots of stores to shop. We had a wonderful stay, very comfortable space for 4 people. Exactly as described. Great place to stay. Very happy with our stay here and found the property exactly as described. Everything we needed was there plus heaps of stuff we didn't need! Would definitely stay again. Overall,we were very happy with this vacation condo.The location was great with beautiful walks all around.The view from the lanai of lush plants and trees with peek of the ocean was a delight.The pool was very near and we appreciated it.Some of the kitchen utensils,for example a very thin frying pan,were not convenient.We would have liked to have had a few dishes appropriate for Asian cuisine.The only real complaint we have is the linen in the master bedroom was very shopworn.We did have a wonderful vacation and would rent this property again. We stayed in a two bedroom that was very comfortable. Lots of kitchen and beach items. The birds are very loud in the morning and afternoon, but we loved it. It's a short walk to the shops at wailea and short drive to great beaches. Security staff was excellent and very nice and helpful. The only thing that we were bummed about is tennis. There is no tennis at the complex but lots of pictures of tennis when we booked. The tennis is not affiliated and $40 a day to play. Otherwise we were very satisfied and will return. The unit presented even better than in the photos. We were very impressed. The beds were the most comfortable out of all accommodations stayed in. It was very clean and well looked after. The double shower was massive! We have 2 small children & there were beach/pool toys provided in the unit which was a nice surprise. No issues with road noise, in fact, being the first unit in from driveway made it easy to get in and out and being directly opposite the pool was perfect. Make your dream vacation the perfect experience! We stayed in Grand Champions in Maui. It was fantastic. The property is simply gorgeous and the condo was very clean, tastefully decorated and perfect for our needs. We cooked and ate breakfast on the patio each morning, while overlooking the ocean and tennis courts (and visiting with birds who stopped by for toast and bananas! ), then headed out to explore. We returned at night for a relaxing evening and woke up refreshed for the next day. The check in and check out process was amazing, the guest services staff was very friendly and helpful. Staying in a vacation rental was not only less expensive than staying in a hotel, it was also much more enjoyable. All the comforts of home in the beauty of Maui and a stress free vacation. We stayed for 6 nights in July and were very pleased with this condo. Upscale amenities and very clean. The second full bathroom was a very nice addition. I would definitely stay here again. Great. Condo was just like the posted photos. Spacious and nicely decorated. The light was out over the front door...we let the rental company know and the next day it was fixed. Beds were comfy and we had plenty of towels. WIFI was spotty but hey you're on vacation so unplug. ?? The condo parking spot was very close to the unit & it's directly across from the pool. I heard no noise at all except for the birds which was actually nice. I've stayed in another unit (a 1 bedroom) at Grand Champions but I'd rent this specific unit again. Me and my two children stayed in this unit. My final thought was this: take the $4000 u.s ($5600 Canadian) that you received from me and throw it toward updating this rental because it has great potential. Leave trash bags equal to nights stayed. Provide beach chairs, buy new single beds and buy bedding that at least fits a "single bed" not at "queen". I would recommend this location to a friend, but reluctant to suggest this unit until more updates and single beds upgraded to good decent mattresses. I had a great time in Maui with my family, great CONDO, the best possible location. I can't wait to have the chance to go back. Highly recommended !. 1) Upgrade the refrigerator and coffee maker-- The refrigerator seemed to not be able to produce enough energy to keep our food cold. Lots of condensation on our food. We were only two adults and a toddler and didn't have much in it, but my daughter's milk and food was not as cold as we would have liked. The coffee maker is old and stained- time for an upgrade! I can't imagine the refrigerator being able to handle a large load of food in the case of 4-6 adults. 2) The bedroom linens and mattresses are in need of a serious upgrade. The mattresses are flimsy and make all kinds of squeaks and creaks when you toss and turn in both rooms. The sheets and bedspreads were thin and very old. I think an upgrade to new sheets, duvets, and better mattresses would be a big plus in both rooms. The headboards are a bit dated but no big deal. Grand Champions 51 was an awesome place to stay. There were 2 couples in our group. Plenty of room for all of us. Kitchen was well equipped. Nice view of the ocean from the lanai. The birds were a little annoying when we got there but provided nice background noise by the time we left. The Safeway grocery store is 10 minutes away. The ABC store is in walking distance. Great location, great time, great price. I would stay here again in a heartbeat. Our family of 5 stayed 4 nights and all worked out great. Only improvement I would recommend would be better bedding for pull out couch. My daughter wasn't comfortable on the mattress. Dining room light out, no kleenex, insufficient toilet paper, but great location. The place was fantastic. Waking up to birds singing every morning was a huge treat. Great location in Wailea. A ten minute walk to the beach, but great excercise. The condo was great, clean and spacious. We really enjoyed our Spring Break vacation on Maui and at the Grand Champions Unit 51! The kids loved the unit and the close proximity to the various beaches in Wailea. Unit 51 is almost perfect. A major benefit of this unit is that it's located adjacent to the tree lined entrance of the property. The only major drawback of this unit is that a HUGE colony of birds have made a home in the bamboo trees in this mini forest. Because we don't like to use the air conditioner, we were serenaded each morning between 5:00-6:30am. If you like using the A/C, this won't affect you. Aside from that, everything was GREAT! We have stayed at Grand Champions two times while in Maui! Both times, we have been very pleased with our stay! We enjoy the complex for our family. Every unit has been stocked with towels, kitchen supplies, chairs, and the comforts of home! The location is just minutes from the beach by car or foot. We are very thankful for Grand Champions. It's affordable and allows us to vacation in Maui longer, due to the affordable cost and family friendly atmosphere. Mahalo! the only thing that was a disappointment was the washer and dryer was very dirty. the condo was not dusted very well either when we got there. The Best Place to Have A Family Vacation!!! We loved our time at the Grand Champions, we took our our whole family to Maui and this was the best place we ever could have taken them. Everything we needed was within 10-15 minutes, shopping, beaches and great waves, and fabulous food!! The Grand Champions certainly have my vote. We had a beautiful vacation in Maui without paying the high hotel prices. Wailea is "Paradise" to say the least!!! We realy enjoyed our stay at the Grand Champion.The condo was well located and safe. The pools were great.The view of the sunset was fantastic from the lanai. Exceeded expectations by a mile! From the moment we arrived we were amazed at the way the condos we rented (we had #48 as well) were decorated, furnished and stocked with anything we could possibly have wanted for our holiday. Even items for the beach were there. I can't think of a bad thing to say. Would love to go back. Had a wonderful stay. Only con was the lack of bath towels. There were only 4 bath towels, would have been nice to have another towel each or even one for the baby. We loved this condo. Furnishings are attractive and very comfortable. We were rarely aware of neighbors. The view straight out the sliding glass door to the lanai is lush vegetation. You don’t see another building, let along people. From the lanai, looking to the right, you see vegetation out to the sea, except for a few tennis courts in the distance. We heard the birds in the morning, but unlike the reviewer who complained of their “cacophony”, we liked their songs, which added to the feeling of being in the exotic tropics (rather than back home in Albuquerque). We hardly ever needed the AC, but when we did, it was good to have an AC unit in each bedroom and in the living room/kitchen—many other condos we considered only had one in the living room. The only significant negative is louvered interior doors, which do not block out light (and probably do not block out sound as well as standard doors). One person in our party was awakened one time by light from the living room/kitchen when others were still up. Overall great stay in #51. Everything we could think of was there (kitchen, beach stuff), nice and clean. Size was great for couple with teenager and grandparents. Directly across from pool/bbqs was awesome. Walking to Shops at Wailea, Grand Wailea. Quiet unit, other than the birds at happy hour time, but didn't bother us. Lanai good size with table and comfy chairs. Definitely returning! We enjoyed it very much and thank you for recommending the place where we stayed. Overall a very good experience. Price was reasonable for Wailea and unit was in good condition. Maui Condo Rentals with Mauiman.net are easy to book. Maui is a perfect vacation spot for your family or just you and your partner. The beaches, waterfalls, palm trees and a cold Mai Tai make the island of Maui a perfect place to relax. Mauiman.net has the perfect condo for rent in Maui for the most reasonable prices. Our prices are cheaper than at the booking offices right on site. Our Maui condos have great amenities such as nearby restaurants, shopping, beaches, parks and activities. We even offer booking of Maui activities so that all you have to do when booking your Maui Condo Rentals is to mention to us what you would like to do and we will recommend the best activity. All of our Maui Condo Rentals are kept clean and in great shape so that you may feel at home and at ease. Our condos are located in the best locations around the island of Maui. The best communities on Maui for vacation are Kaanapali, Kahana, Kihei, Maalaea Bay, Makena, Napili Bay and Wailea. You can find condos in all of those wonderful locations. Choose from beachfront to jungle and in between for the best condos for your preferences. Mauiman has been helping deserving people rent condos in Maui for many years now and has established a great reputation for offering the best prices. After serving thousands of happy customers we have learned what is expected and deliver it every time. Book with us Today!